An example water molecule formed by Teach Tiles of its component atoms. An example math problem using multiplication and numbered Teach Tiles. A sample of the elemental Teach Tiles. 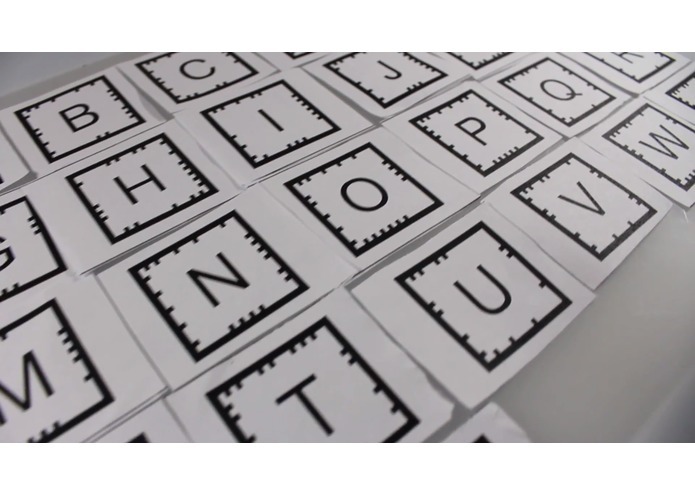 A sample of the lettered Teach Tiles. 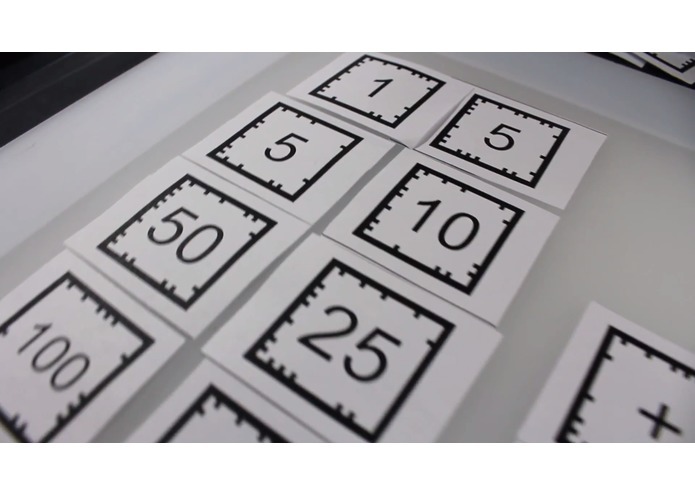 A sample of the numeric Teach Tiles. Augmented reality is a emerging technology with great potential in the area of education, but it has yet to be fully utilized in a practical and cost-effective way. 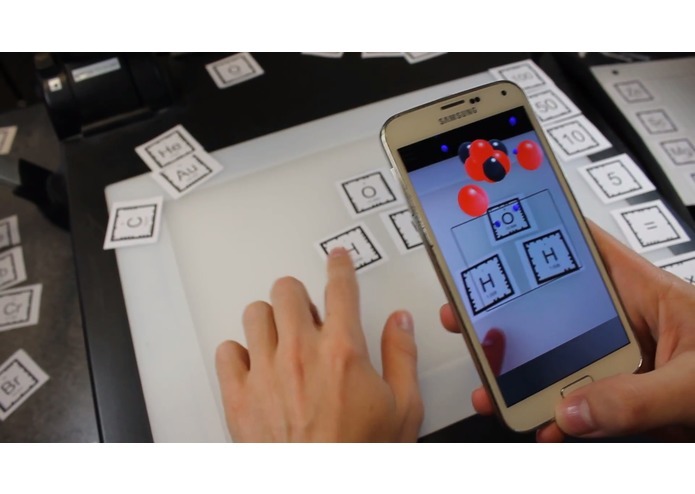 Teach tiles is an augmented reality teaching aid. 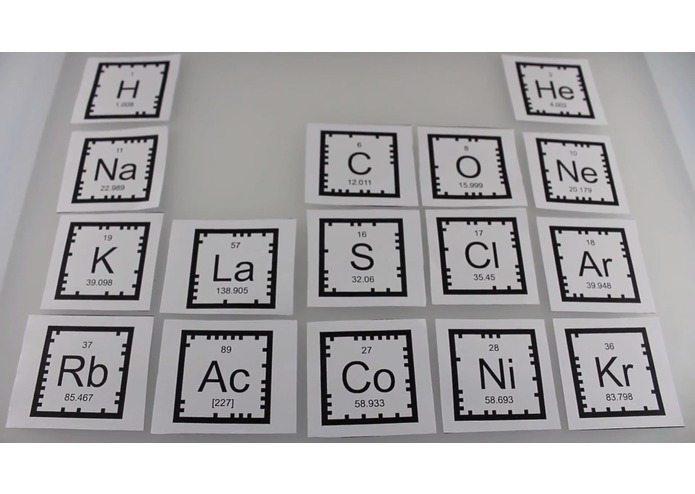 An instructor can print out one of a number of a available sets of tiles relevant to a given subject. 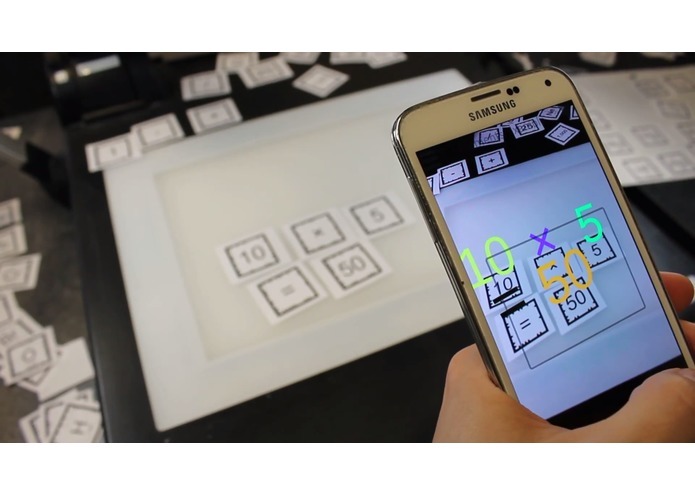 The Teach Tiles app uses an AR layer to transform the tiles into interactive 3D visual aids. To solve quiz questions and other activities, students must manipulate the tiles according to clues provided by the app. We used the Vuforia AR API in Unity and C# scripting, and tested the app by sideloading it onto our Android phones. The physical components were made using Microsoft Powerpoint and Vuforia vision targets. None of us had done a hackathon before and we did not sign up as a team. None of us had a solid concept for the hack going into the event. We finished! We worked collaboratively very well considering we met each other minutes before starting the hack and all came to agreement on a solid and deliverable concept. We met our primary goals with enough time to add some polish. Coding with 2 hours of sleep is hard. Group dynamics are more important than individual talent. More modular sets in different subjects and an interface for creating custom activities. I designed and created the physical Teach Tiles, helped design the user experience with each of the different tile sets, and filmed and edited the final presentation video. 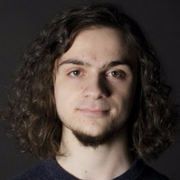 I wrote the Unity code that interfaced with the Vuforia API to make the app respond to different combinations of tokens. I wrote C# code to handle the motion of the 3D atom models and spearheaded the overall design.